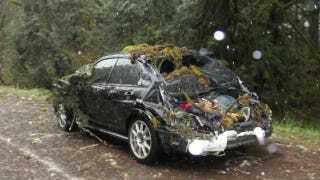 An Oregon man and two women were driving in a sudden windstorm when a massive pine tree fell on their 2007 Subaru Impreza STI. All three survived, thanks, the owner says, to his car's go-fast modifications. The sheer magnitude of this story makes it difficult to recollect. Nothing like it has ever happened to me or anyone I know. It is probably best to start at the beginning. I was one of those irritating new STi forum posters. I spent months reading and lurking through the sites and had a number of what I would consider ‘new Subaru shopping question'. Everyone was patient and helpful even though they had probably given the same advice a hundred times to people just like me: get a leak down and compression test, don't forget to check out the newbie section as there is a ton of good information there. This led me to purchase my first Subaru: Obsidian Black Pearl 2007 STi. Words can't describe how much I've enjoyed this car. It was a college graduation present to myself and there is nothing I've enjoyed more. I had a Cobb short shifter and a new paint job. What I would consider tasteful modifications. Two days ago, my brother and I spent the entire day installing my new Cobb Turbo-back exhaust and heat shield. Going stage-two was the most rewarding process I have –ever- done to a car. The goal was to complete the stage-two upgrade so I could go snowboarding the next day. Yesterday was a beautiful day. I, my girlfriend Stephanie, and my director of human resources Heather headed up the mountain for Heather's first time snowboarding. The conditions where beautiful, but unfortunately they wouldn't remain that way for long. We left Willamette Pass at around 3 pm. On the way home we drove directly into a vicious windstorm in the middle of the Oregon forest while driving the Willamette highway roughly five minutes west of Oakridge. Within no more than a hundred yards we went from beautiful utopian skies to an onslaught of seventy mile per hour winds. It was here I knew we were in trouble. We were the only car in sight and the winds were pounding the towering trees. Hundred foot trees battled the elements as I attempted to navigate between the falling tree branches. I then noticed the first tree, easily a hundred foot and probably 6 feet in diameter, falling in front of us. I slammed my brakes and the tree crashed across the highway exactly where we would have been. At this point the sheer magnitude of the situation pressed on me. We were surrounded on both sides by massive hundred foot trees. In addition, we were easily 30 minutes to the next town and getting around the tree would have been impossible. I did the only thing that made sense. I slammed my Cobb short shifter in reverse and intended to spin my car the other direction. I gave it some gas and witnessed the worst thing I have ever seen in my life; a tree, bigger than the first was already in free fall coming down on top of us. The tree was at roughly a forty degree angle already and the next second was the longest in my life. Three things happened within the next second. I did my best to judge where the tree was going to fall; it was directly on the roof of the car. I then ripped the car from reverse and crashed it in to first gear and slammed the gas attempting to rocket us away from the falling tree. Knowing there was nothing more to be done I screamed ‘get down'. No more than a quarter of a second later the tree fell on top of us. The crash was like nothing I had ever heard before. The cab was darker now, under the girth of the tree it blotted out the daylight. I wheeled around to check on Steph and Heather. Everyone was okay. I turned off my car and attempted to judge the situation. There were five inch wide branches surrounding the car. Several of which were on top of us. The roof had held. If any of these circumstances had been changed we all would have been dead. The trunk of the tree was directly behind Heather. Knowing we were buried, I called 911 and told them we were buried under a tree and our location. They transferred me to the state police who took our name and number. When it was clear help wasn't coming I told the state police that I was going to attempt to move the car to get us out from under the tree. I fired the STi to life and it rumbled with the sound of power. The car groaned as I began to let off the clutch. ...We got out of the car and ran to an eighteen-wheeler on the other side of the first tree and waited out the storm. My faithful STi, with its brand new stage-two modification pulled us out from under a seven foot diameter tree. Its roof had stopped 5 inch branches from beheading us. Its Brembo brakes had kept us out from under the first tree. Its short shifter made getting into gear a fraction of a second faster. Its stage-two performed the day before gave us the acceleration to get the roof of the car out from under the trunk of the tree while it was falling. The trunk of the tree fell less than two inches behind the rear seat where Heather was sitting. If any of these circumstances had been changed we all would have been dead. I'm going to include the pictures we took of the accident. Take a look at the angle the tree cut off the trunk. That shows the speed we used to get out from under the tree. Three survivors walked out without a scratch after having a tree cut their car in half and all three of them told the same story. Today, a STi saved their lives.